I am thankful to the blogospere for a lot of things, but I’m most thankful for the amazingly talented friends that I have made. One such very creative mind is a dear friend Arthi Anand Navaneeth. When I found out about the release of her second book, Ranganna, I was delighted and couldn’t wait to get my hands on it. 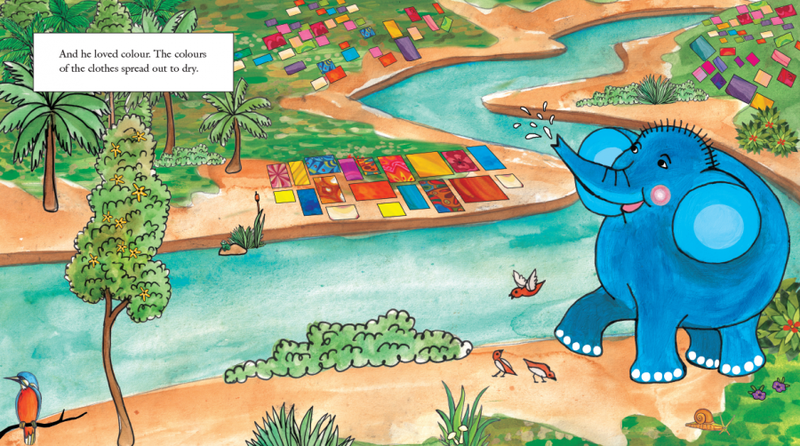 It gives me immense pleasure and joy to be reviewing it on the blog today..
Ranganna is a cute story of a little Blue elephant who loves colours – The colours of the rainbow, the colours of the clothes spread across the dhobi ghat to dry, and all things that surrounding him. One day he meets two little girls, Aditi and Anushka (Incidentally the author’s kids names) and notices something very exciting about them.. 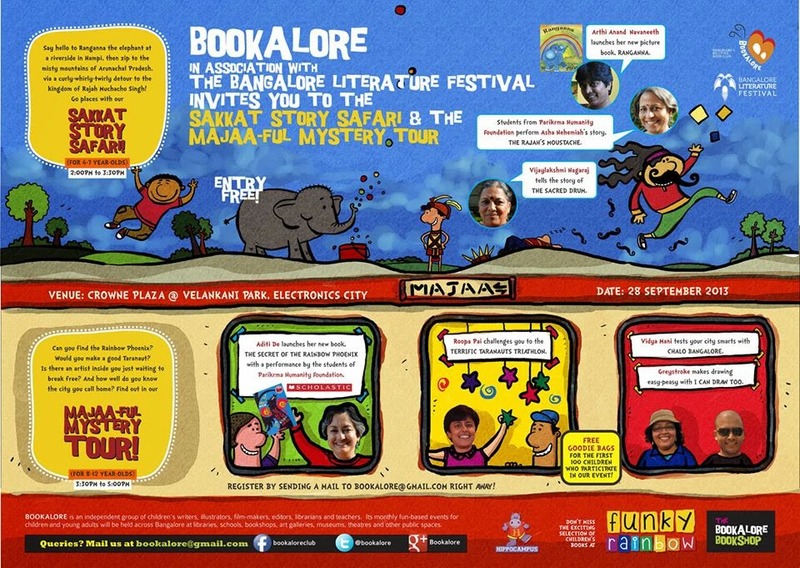 The story then follows a cute little adventure with Ranganna, Aditi and Anushka that is sure to delight you and make you break into a happy Elephant dance, just like Ranganna at the end! I love the simplicity of the story and the subtle references to ranganna’s roots. Notice his name? Rang (colour) anna ( a play on his kannadiga roots) The illustrations are absolutely A.D.O.R.A.B.L.E . Kudos to Kavita Singh Kale for really bringing the character to life. The story is easy enough for a 4 year old to read on his own. What makes this simple story such a hit is that each one of us can relate to the joy of simple things. I for one get absolutely delighted when I see a flower bloom or with the aroma of freshly baked bread. I would definitely do a Happy Elephant dance in my head too. Lil p loved the illustrations & was delighted to read the names of her friends. Wow! mamma, Aditi and Anush are sooooo lucky!, She piped. She started making up her own stories with Ranganna, A & A.. Imagining them going on many many adventures in the future and painting their town red, blue & purple .. If you’d like a copy of this delightful book – You can order it from Tulika Publications. 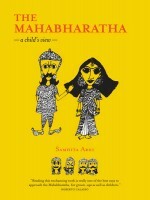 The book is available in English, Hindi, Tamil, Malayalam, Kannada, Telugu, Marathi, Gujarati, Bengali. Arthi Anand Navaneeth is a marketing professional and writer. Have You Seen This? 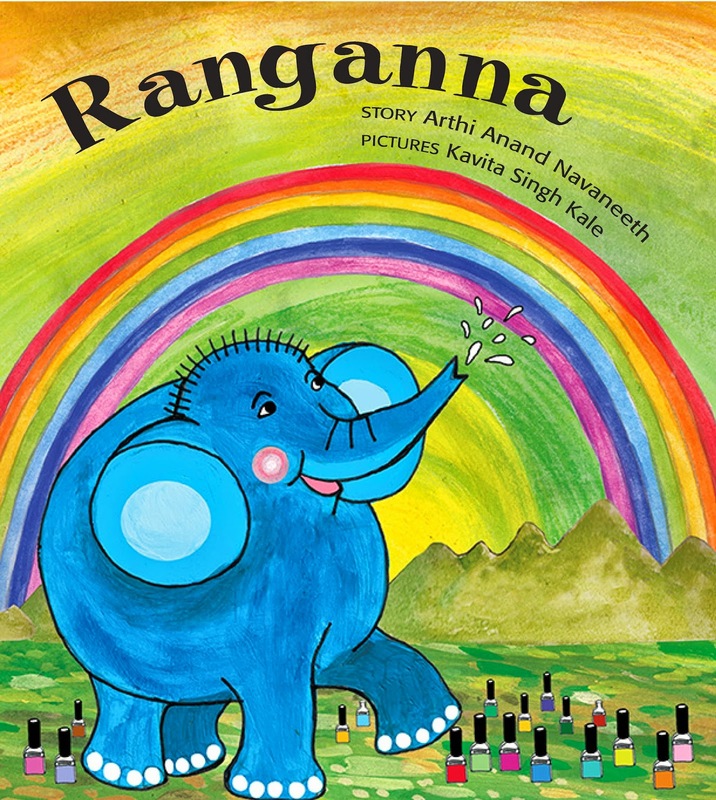 and Ranganna are her picture books published by Tulika. She is a reviewer at Saffron Tree and a weekend storyteller. 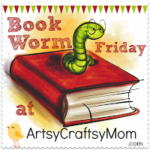 She blogs about her storytelling adventures at Art’s Tales. Sounds like a fun read. Though my kids are a bit old for the book think I’ll still get it. Ranganna looks like the cutest elephant ever.